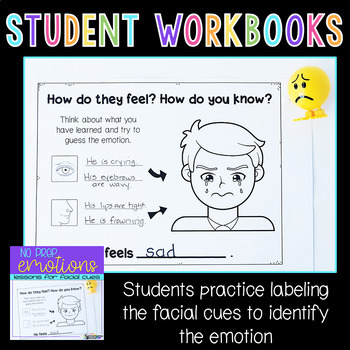 If you struggle with knowing how to teach your students how to read facial cues in a concrete way, this product is perfect for you! These pages were designed to be NO PREP so all you need to do is simply Print and Go! 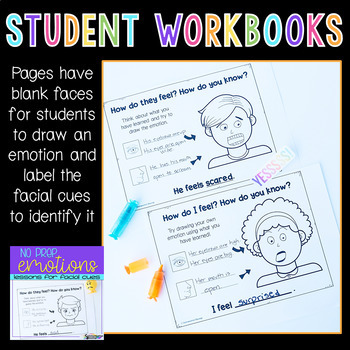 Teaching Visuals: These pages are intended to be used as visuals for teaching your students the facial cues associated with various emotions. I strongly recommend doing the teaching portion in front of a mirror so your students can see and feel how the emotions differ. Model the facial cues for them, talk about the cues, and have the student try to mimic them while looking in the mirror. 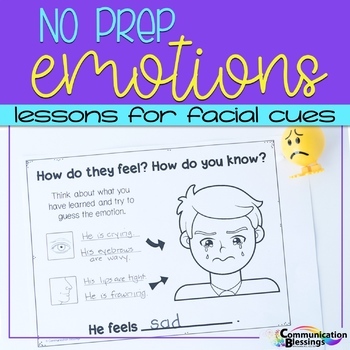 Making the facial expressions with them in the mirror not only helps them self-correct, but it also makes the lesson engaging and tons of fun! Student Workbooks: These pages are designed to be mixed and matched to suit the needs of your students. There are many options for assembly: 1.) The pages can be printed, stapled together, and sent home., 2.) You can slide the pages into page protectors and put them in a binder to use with dry erase markers and save on printing., or 3.) You can hole punch the pages and put them into a 3-prong folder for the student to use as a reference guide. If you have any questions, please ask before you purchase!